There have been a few D23 events over the last couple of weeks and they have featured a lot of props and memorabilia from Lost especially for the Lost auction due to take place onec the series has finished. However one exhibit is for the Lost University which is surprising in one way as LU is not a product yet, and is in truth a marketing exercise. That being said, it is very welcome and I've been planning to post lots of information about the exhibits. 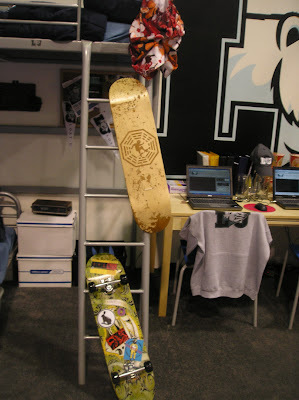 The picture below is from that blog site and shows the Lost University dorm room complete with a Johnny Cupcakes skateboard deck that was given away at the poster 2 reveal.